Even though AW Painting and General Contractors’ work in all aspects of industrial and commercial remodeling, we also specialize in commercial drywall repair in the Greater Philadelphia area. Serving the Tri-State area we provide efficient drywall repair from start to completion. 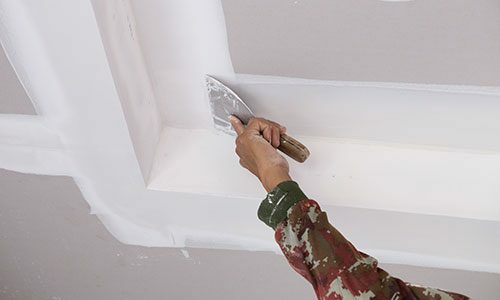 Since drywall is used to make interior walls and ceilings, we follow strict safety standards and conduct meetings to keep the commercial site safe for all parties. Our set procedures in each phase of production also help ensure safe working practices and a safe final product for whomever the end user will be. No matter what, our primary focus is on the safety and wellbeing of everyone involved in our drywall work. Check framing before hanging sheetrock. Engage in extensive masking and covering to guarantee a spotless and dust-free environment. Cover other areas like patios and floors. At AW Painting and General Contractors, we provide complete drywall construction and repair services. However, we also take preventative measures to make sure the environment is as clean and safe as possible during drywall construction and after. At AW Painting and General Contractors, you can expect punctuality and professionalism during all stages of your commercial drywall repair. It is no suprise as we have been offering our drywall repair services to Philadelphia residents for over 40 years. We pride ourselves on our exceptional customer service, high quality of work, and efficiency in your commercial space. Our contractors carefully examine the drywall space to determine the best solution for repair, replacement, or remodeling. Our team will then work quickly, adhering to all safety standards. Water or environmental damage may necessitate the use of a primer or accelerated primer. However, the majority of commercial drywall repair will require surface work like sanding. Drywall repairs can be overwhelming due to the noise and mess. But as experienced contractors, we meticulously cover all furniture with canvas and plastic tarps. Additionally, we clean and remove any debris left from the drywall hammering and work. We get rid of drywall waste carefully, protecting the commercial space first. If you have any questions, comments, or would like to arrange a consultation, get in touch with us today! We look forward to assisting you.